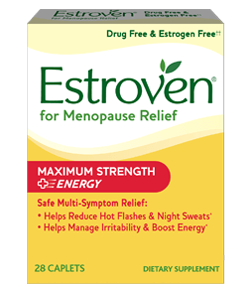 Estroven® 92961040072 New and Improved Estroven® Sleep Cool™ formula has been enhanced with clinically proven Melatonin and clinically proven Soy Isoflavones plus Black Cohosh to help reduce the frequency and severity of hot flashes and night sweats. * When taken as part of a nightly regimen, Estroven® Sleep Cool™ helps you to have a restful night’s sleep and wake up feeling refreshed. * For best results, daily use for a minimum of 60 days is important. Estroven Sleep Cool is rated 4.7 out of 5 by 412. Rated 1 out of 5 by Laura1484 from Not helping I’ve been using it for about one month. No changes in my hot flashes or sleep. Don’t know if I should continue another month. Very disappointed was expecting some relief. Rated 5 out of 5 by Kcole from No more sweating!!! My head, face, back and pretty much everything else was sweating and had for years. My Dr wouldn't prescribe hormones stating I was too old. I saw this product on store shelf and purchased. I love it! Almost all my sweating is gone. I can wear foundation again because it doesn't slide down my face. I cannot begin to express how wonderful it is not your have to go to a restroom to towel off or have a salesperson ask me if I'm all right. I told my Dr and he even wrote down the name and where to buy. Oh by the way I'm sleeping better and I no longer sweat. Rated 5 out of 5 by Candi from Feeling better.! Started having night sweating and sleepless nights. Been taking this for almost a year,everything is great,and i sleep like a baby. Rated 3 out of 5 by Becky1 from I might try it, can't believe they took i-cool for menopause off the market, I'm so angry! Rated 5 out of 5 by bevm from A return to product I used the sleep cool and the purple one, the sleep cool really helped me before to sleep better, its a nightmare without something, as they dissappeared for months but now its back again so i bought product again because they work. thank you. Rated 5 out of 5 by Anonymous from LOVE LOVE THIS PRODUCT I have been using this for years ..it helps me sleep and control my menoupause symptomps I wanna try the Estroven weight management also reading good reviews about it. Rated 4 out of 5 by TAMMY196712 from Enjoying so sleep at night Have been taking for about a mon the now and am sleeping better. Still have some nights when I wake up but I usually can fall back asleep. Rated 1 out of 5 by moatsv from Not helping I have been taking this consistently for months waiting for it to kick in but it’s not. I am so tired all the time because I only get about 3 good house of sleep a night - if i’m lucky. Estroven® Sleep Cool™ does not contain synthetic estrogen, preservatives, yeast, wheat, gluten or lactose. 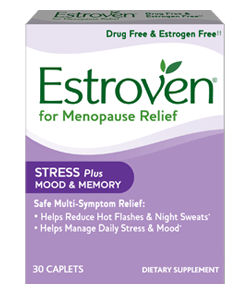 How does Estroven® Sleep Cool™ relieve hot flashes and night sweats? How does Estroven® Sleep Cool™ help you fall asleep & stay asleep? Will Estroven® Sleep Cool™ cause me to feel drowsy and/or groggy in the morning? Estroven Sleep Cool™ contains clinically proven Melatonin to help you fall asleep easier & stay asleep. * Melatonin is non-habit forming. It should not cause you to wake-up feeling drowsy, and may improve daytime functioning. * However, we do not recommend operating a motor vehicle or machinery after taking this product. How quickly does Estroven® Sleep Cool™ work to help me fall asleep & stay asleep? Everyone’s response is unique. However, based upon clinical research, similar products with the ingredient Melatonin have been found to work within 30 minutes to an hour. Is Estroven® Sleep Cool™ something my body will become dependent on? Is it safe to drive after taking Estroven® Sleep Cool™? We do not recommend operating a motor vehicle or machinery when taking this product. Does Estroven® Sleep Cool™ contain soy? 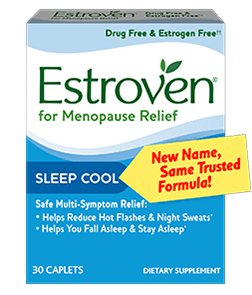 Does Estroven® Sleep Cool™ contain the hormone estrogen? No. Estroven® Sleep Cool™ does not contain synthetic, animal or human-derived hormones. Can I take more than the recommended serving of Estroven® Sleep Cool™? No, Estroven® Sleep Cool™ should be taken as directed. It has been formulated with amounts of active ingredients to achieve the desired benefits. 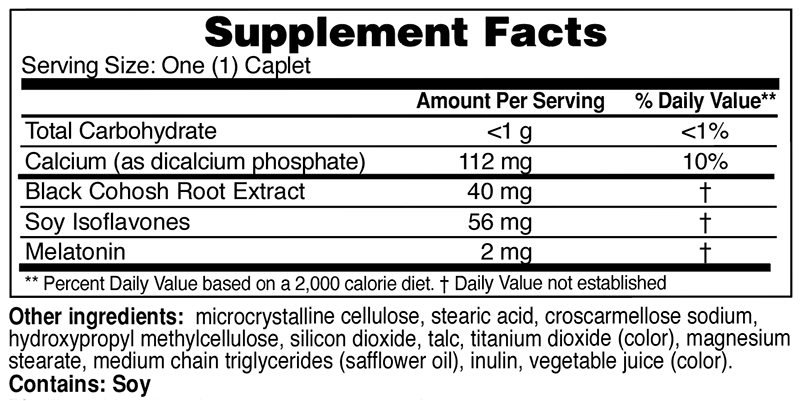 Can I use Estroven® Sleep Cool™ with other dietary supplements or medications? We recommend speaking with your health care professional to see if taking Estroven® Sleep Cool™ with other dietary supplements or medications is appropriate for your individual situation. Can I take Estroven® Sleep Cool™ with a daytime Estroven® product? 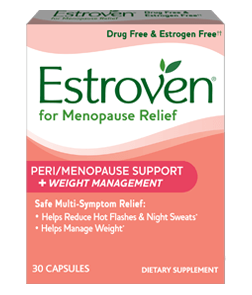 No, Estroven® products are developed to be used individually to address hot flashes and night sweats as well as other menopausal symptoms. * Estroven® products should be taken as directed. They have been formulated with amounts of the active dietary ingredients to achieve the desired results. How should I store Estroven® Sleep Cool™? Please store Estroven® Sleep Cool™ at room temperature. Do not expose to excessive heat, humidity or direct sunlight. What are the directions for taking Estroven® Sleep Cool™? Take one (1) caplet per night. For best results, daily use for a minimum of 60 days is important. 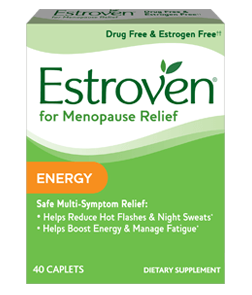 How long should I take Estroven® Sleep Cool™ before I start to see relief for my menopause symptoms? Results vary based on each individual’s symptoms and needs, however for best results we recommend daily use for a minimum of 60 days for menopause relief. As with any dietary supplement, please inform your health care professional before taking. Do not take if pregnant, breastfeeding, or intending to become pregnant. Keep out of reach of children. Do not operate a motor vehicle or machinery while taking this product.